An International Kite Festival is held at Ahmedabad on January 14 every year, to coincide with the festival of Uttarayan or Makar Sankranti. Makar Sankranti is a festival that heralds a change of season marking the movement of the sun into the northern hemisphere - a celebration to mark the end of winter. The skies are blue and clear, a cool breeze blows and a feeling of anticipation, joy and jubilation grips all who celebrate the occasion. In Gujarat, Makar Sankranti is celebrated as the kite-flying day. Kite-flying day in Gujarat is an extraordinary day, unlike at other places. Ahmedabad, Gujarat?s premier city, leads the way in the celebration of Uttarayani, and is the venue of the International Kite Festival. A kite-flying festival is held in important cities of Gujarat each year. The festival draws expert kite-makers and flyers not only from cities of India but also from around the world. Designer's kites of infinite variety are displayed at the venue. 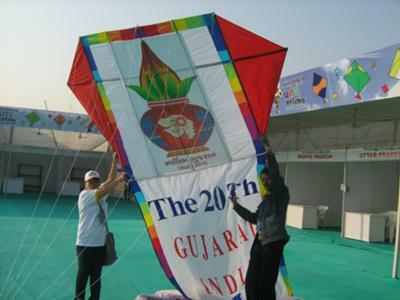 The International Kite Festival is a special Add on for Gujarat Tourism. Thanks Paavan. Nice pic too... Can't say I have ever seen that configuration of kite in the air over here in Australia. I imagine the tail would be many meters long, tapering slowly to a short width? Spectacular!